Climate models relied upon by scientists and governments may be greatly overstating the warming that has occurred since the late 1950s, argues a paper analyzing the discrepancies between modeled and observed temperatures. 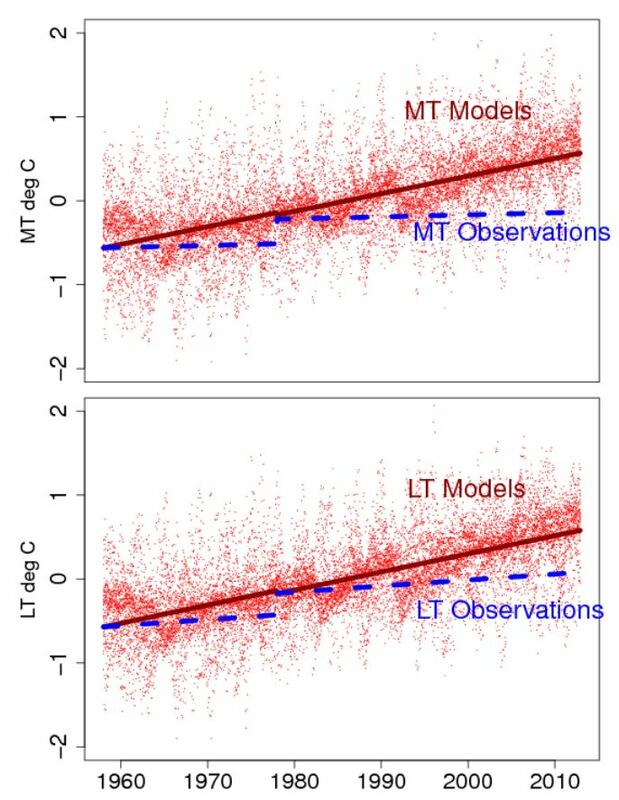 The paper, which was published in the journal Environmetrics, found that observed temperatures differed greatly from modeled temperatures in the tropical lower troposphere and mid-troposphere. “Over the 55-years from 1958 to 2012, climate models not only significantly over-predict observed warming in the tropical troposphere, but they represent it in a fundamentally different way than is observed,” says Ross McKitrick, economist with the University of Guelph in Canada and co-author of the study. According to McKitrick, all climate models predict that rising carbon dioxide levels will cause rapid warming in the troposphere over the tropics. But that’s not what has happened, as neither satellites nor weather balloons have detected much warming in the tropical troposphere — meaning something is likely wrong with the models. “In my opinion the simplest and most likely interpretation of these results is that climate models, on average, fail to replicate whatever process yielded the step-change in the late 1970s and they significantly overstate the overall atmospheric response to rising CO2 levels,” McKitrick said. What this means is that tropical tropospheric temperatures were relatively flat before the late 1970s. Then, around 1977, temperatures jumped up slightly in a phenomenon called the Pacific Climate Shift. But after the climate shift, temperatures flattened out once again, showing little to no warming trend. The absence of warming is another area of climate science that sparks debate. In fact, McKitrick’s study is not the first to point out the inconsistencies between modeled and observed temperatures. In 2006, the U.S. Climate Change Science Program report found there was a “potentially serious inconsistency” in the modeling of tropospheric warming. But climate scientists continue to debate the huge differences between observed and modeled tropospheric temperatures and what it means for predicting global warming. “What I can say from the standpoint of applying the scientific method to a robust response-feature of models, is that the average model result is inconsistent with the observed rate of change of tropical tropospheric temperature — inconsistent both in absolute magnitude and in vertical structure,” wrote John Christy, climate scientist at the University of Alabama, Huntsville.